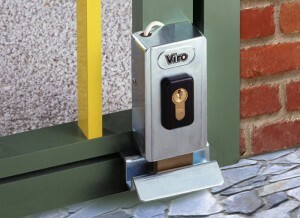 One of the typical uses of electric locks is closing main entrance doors. The problem is that a main entrance door can also be very heavy, especially if it is a large wooden door. But a large metal gate is also very heavy. 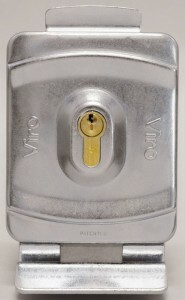 In situations of this type a common electric lockcan break frequently as it is excessively stressed at every opening and closing. 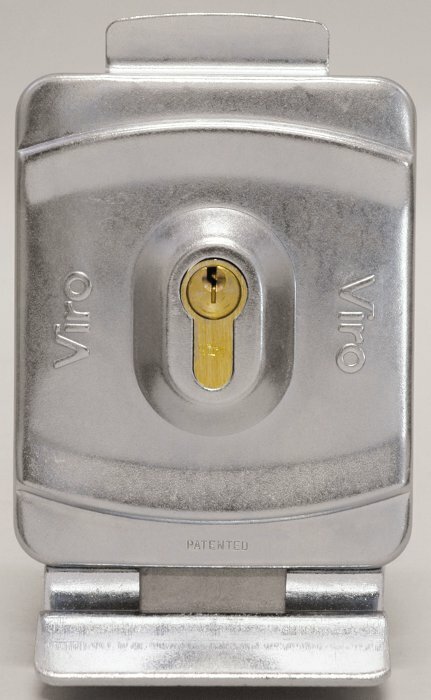 In this case, the Viro electric locks with rotating deadbolts come to the rescue. 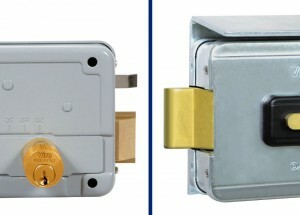 It is a particular type of lock, mainly covered by patent, in which, instead of the common system with ejector and spring latch, uses a rotating deadbolt. 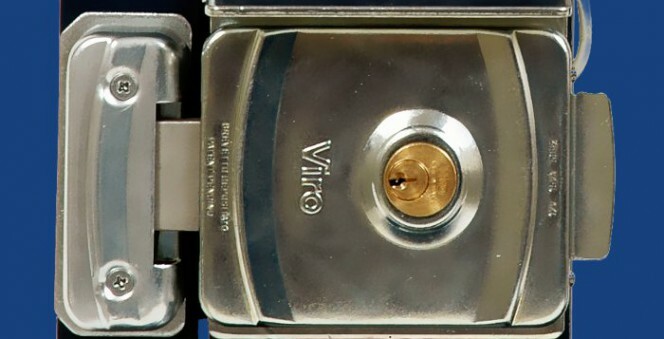 On the left in the photo there is the latch and ejector of a normal electric lock; on the right there is the Viro rotating deadbolt. The rotating deadbolt, which is made of high strength materials such as solid brass or stainless steel, is able to ensure a greater sealing and resistance than the common latches, also thanks to the internal mechanisms which are larger in size. 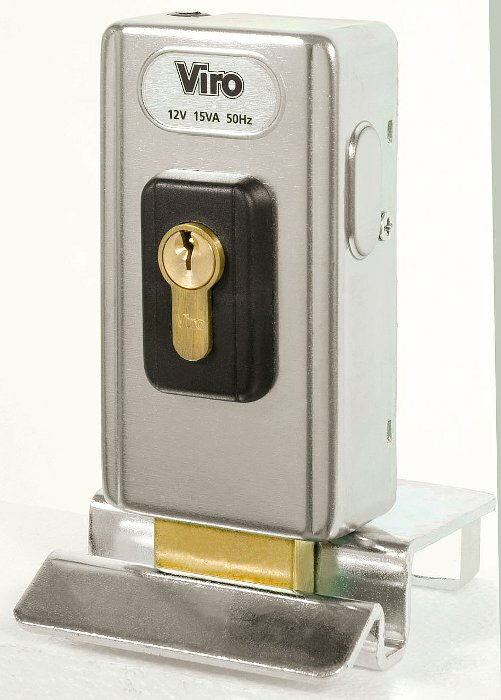 The use of a lock with a rotating deadbolt is particularly recommended on automated main doors and drive-through gates, which subject the lock to considerable stress during each opening and closing cycle. 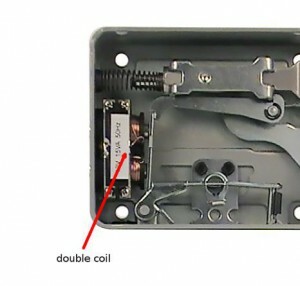 The double coil which uniformly distributes the electrical load, so as to prolong the life of one of the most stressed components in electric locks. The adjustable backset, which enables the same lock to be adapted to various existing set-ups (through holes) of the outer cylinder. 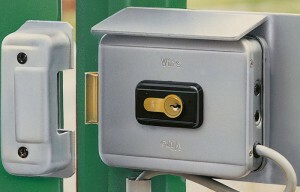 The one-piece case which increases the mechanical strength of the lock. They can work both in “service” mode, which is in common with all electric locks where the lock opens when the button is pressed and in “security” mode, that is, it only opens if, as well pressing the button, the door on which the lock is installed is also pushed. This prevents the lock from remaining accidentally open if nobody has passed through the door during the pressing of the button. In fact, this function, also called “controlled opening“, keeps the locking mechanism in the closed position when the electric pulse has stopped. They can be applied both vertically and horizontally, thus providing great flexibility of installation. A Viro V06 electric lock with rotating deadbolt mounted vertically; it can be seen how it adapts to the small dimensions of the section. 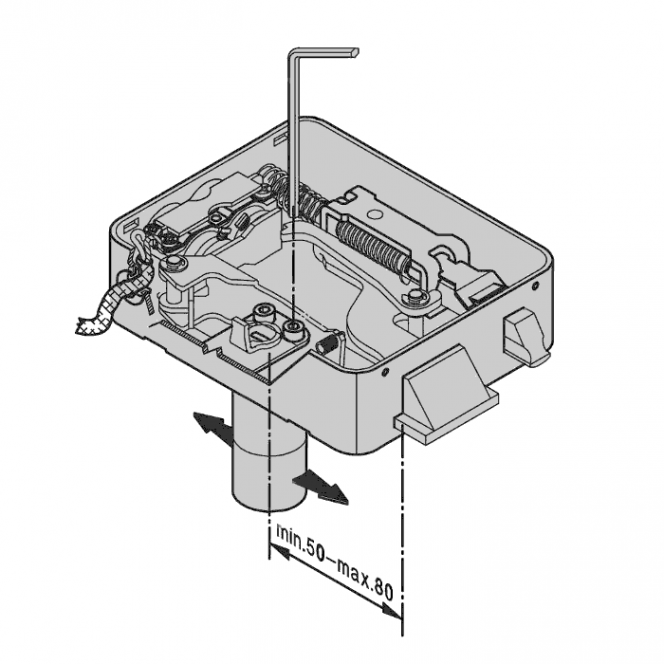 Particularly suitable for installation on narrow uprights is the Viro V06. For doors opening outwards, for example because they overlook uphill accesses or because they are used on escape routes according to the law, there is the V90. 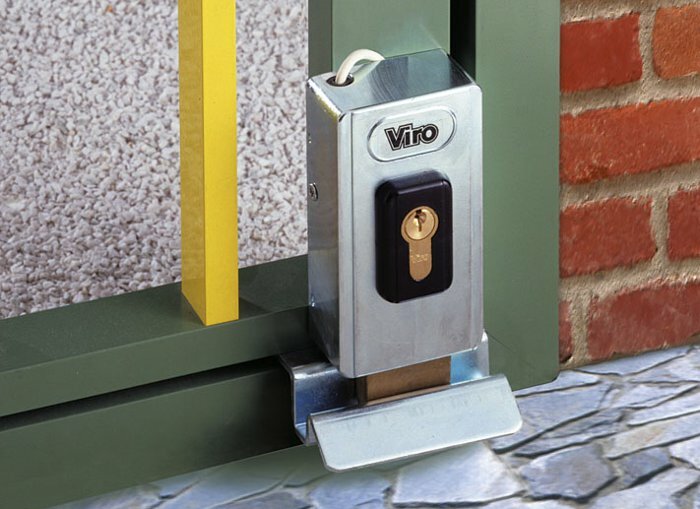 If the button is needed (for example, for the internal release of the lock by pedestrians, in large doors or gates for access to buildings in historic town centres) there is the V9083 with button. A simple rotation of the key in this lock will enable or disable the operation of the button or block the lock in the open position (the so-called “dogging device”). If you want a cylinder with a European profile which can be replaced at will or can be integrated into access control master key systems, locks V06, V90 and V9087 are suitable. In environments with a large temperature range the V9083 can be used (which tolerates even very high thermal expansion without affecting its operation). 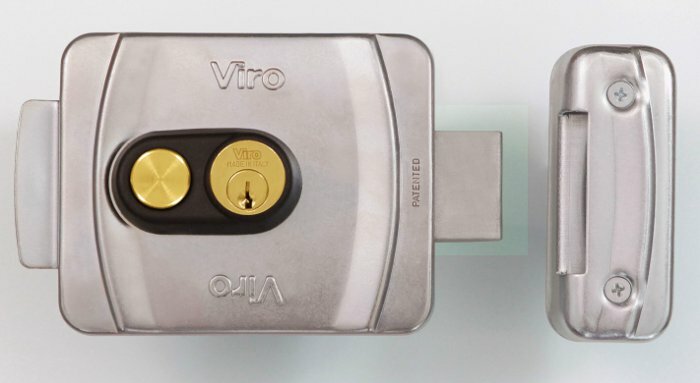 If the electric lock of your door or gate is often faulty, replacing it with a more robust Viro electric lock with a rotating deadbolt may be the solution. Given the number of models available and their flexibility of use, finding the right product will certainly not be a problem. See the technical data sheets of the Viro electric locks with rotating deadbolts: V06, V9083, V9083 with button, V90 for opening outwards.